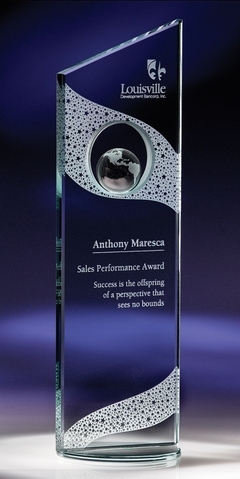 Push the envelope with our innovative Perspective Award made of jade crystal. This unique design features a circular opening that frames an etched globe resting within. The globe is further highlighted with our textural star pattern for a look that says it all. For aesthetics we recommend etching your award inscription and positioning your logo as shown.